Saint Naul's superior firepower and attacking endeavour were the difference in this first round first leg championship encounter. 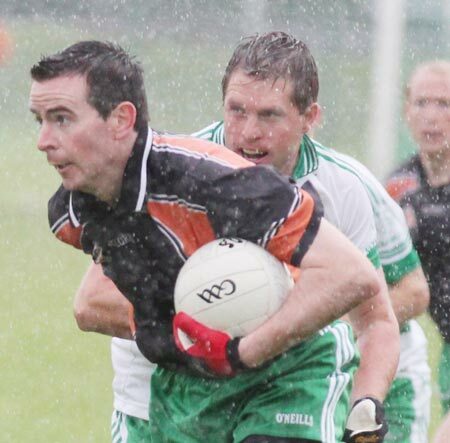 In one respect it was a perfectly balanced Aodh Ruadh performance - they scored two points either side of the break. In every other respect it was awful. In fairness, Saint Naul's weren't dramatically better for much of the first half. A continuous downpour during the first half made the underfoot conditions very treacherous and any chance of open football was negligible. Stephen Griffin had the first semblance of a scoring chance eight minutes in, but he dropped his free short. There were 10 minutes gone when Brian Roper lost possession and Saint Naul's countered for Mark Ward to point. With some stoppages for injuries it was a full nine minutes later when Roper atoned for his mistake and hit a leveling point. 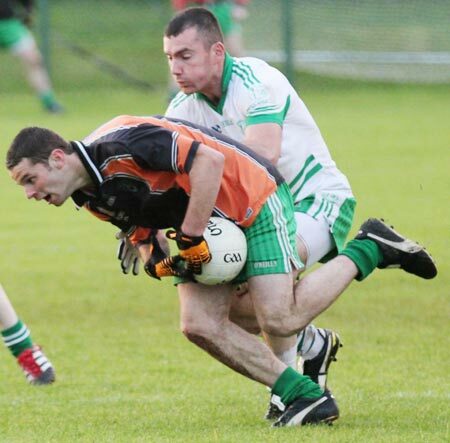 Naul's were enjoying the lion's share of possession, thanks to a defensive Aodh Ruadh line out, but were struggling to make it count. They hit three bad wides in the space of three minutes before Stephen Griffin finally managed to raise a white flag with a close in effort. A minute later Danny McDyre made a menacing move on goal from the right and his fisted effort went over off the post. The same route was used three minutes later with just a minute left in the half. This time the ball flashed across the face of goal. Peter Boyle cleared his line, but the ball only went out a few metres and in the ensuing scramble Shane Coneely laced the ball into the net. 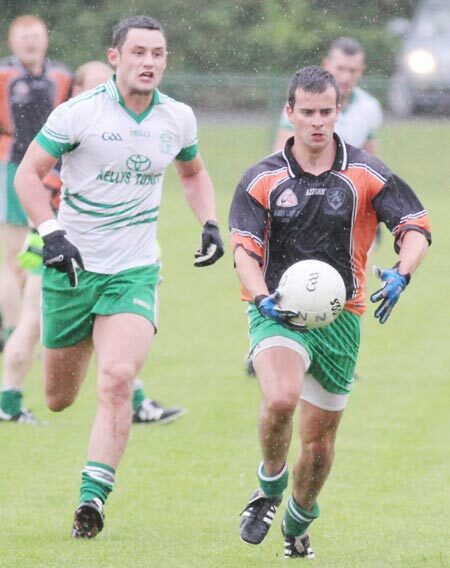 Sticky Ward hit a free to claw back some of the deficit, but a Mark Ward point after Aodh Ruadh, once again, failed to clear the ball ensured that the homesters went in with a five point lead at the break - 1-4 to 0-2. Thankfully the rain stopped at the break and there was some hope that a bit of football might break out. 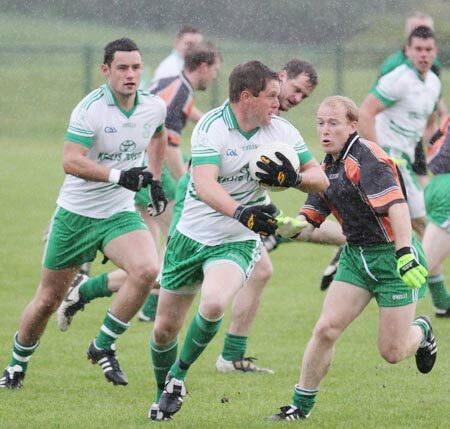 That's what happened, but it was all played by Saint Naul's as Aodh Ruadh persisted with their defensive formation. Stephen Griffin, roaming out to centre field, began to impose himself on proceedings and it was the county man who hit the first point of the half, a distance free three minutes in. 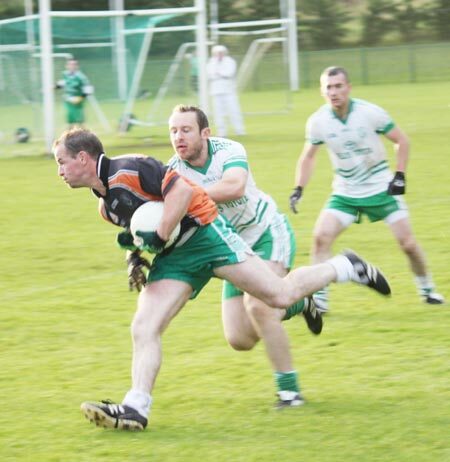 Aodh Ruadh badly needed to get some sort of foothold, but David Dolan hit a rare scoreable free wide as the game went into the fourth quarter. Ronan McGurrin got a score a minute later for the Ernesiders, but it was the Mountcharles men who were about to take control. A Stephen Griffin free and an easy point from play put seven points in it. 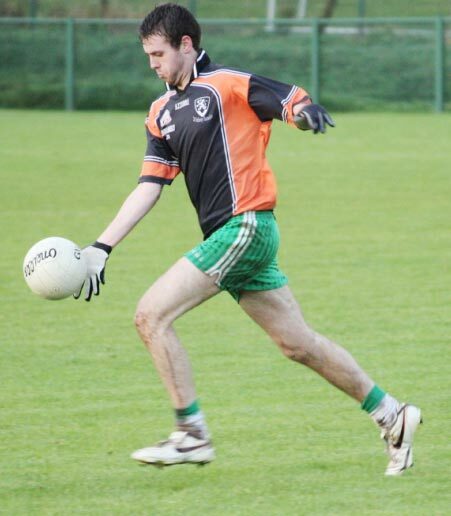 A Sticky Ward free on 51 minutes, was merely a comma in a string of Saint Naul's scores in the closing stages. Stephen Griffin hit the next point on 56 minutes, before a great effort from Mark Ward seconds later. 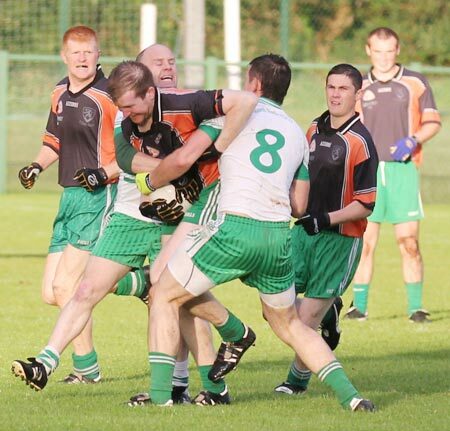 At this stage the fight had totally gone from Aodh Ruadh and Saint Naul's were coming through the Ballyshannon defence in droves. 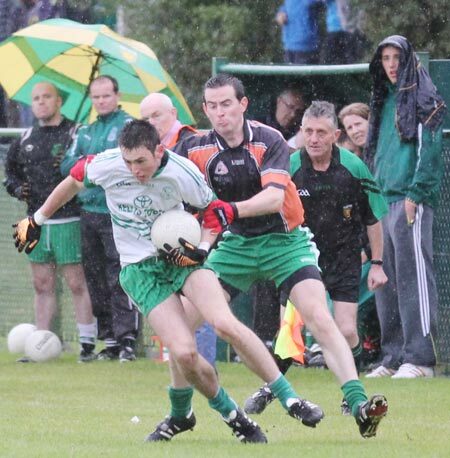 Griffin hit an embarrassingly easy point, which was replicated a minute later by the excellent Fiachra McGinley. As Mountcharles emptied the bench Stephen Griffin hit a free shortly before Jimmy White whistled up to give Saint Naul's a richly deserved 11 point win. The star men were all in white and green. Stuart Johnson was a good attacking threat from deep. 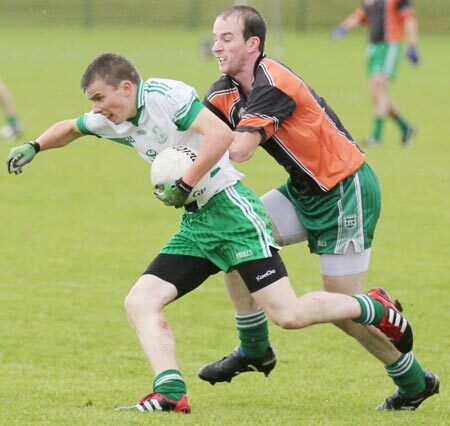 The midfield pairing of Conal and Fiachra McGinley were totally dominant. 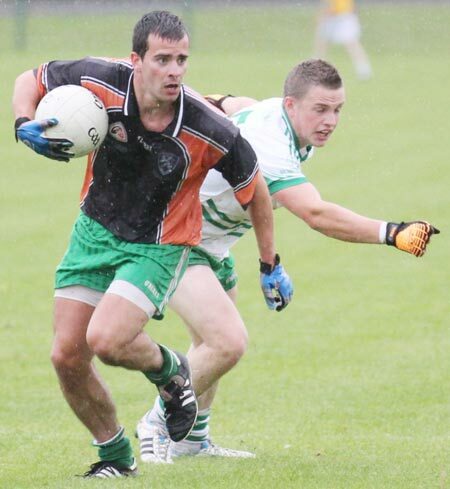 Mark Ward was in fine form with three points from play, while Shane Coneely, aside from his goal, was a tremendously disruptive presence in the Aodh Ruadh back line. 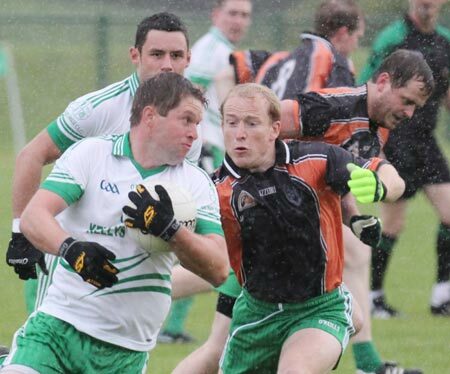 Man of the match has to go to Stephen Griffin. 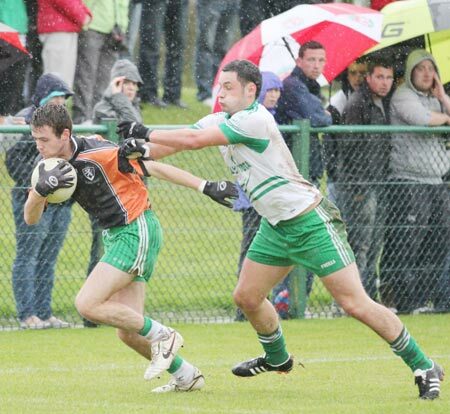 Aodh Ruadh tried to quell his influence by crowding defence, however once Griffin hit his stride towards the end of the first half there was no holding him. Seven points, four from play is an accurate testament to his handsome contribution. When these sides met on 27th May in the league Saint Naul's won 1-6 to 0-15. 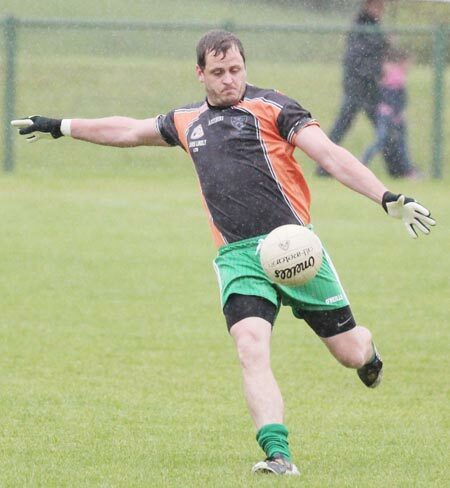 Mountcharles equaled that score again with what was a stirring win, but Aodh Ruadh have some serious thinking to do ahead of the second leg in Father Tierney Park. 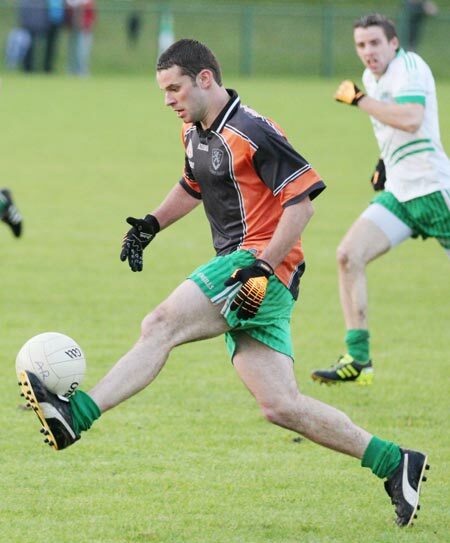 Shane Leonard; John Rose, Gavin Maguire, Conor McBrearty; Stuart Johnson, Daniel Friel, Aidan Kennedy; Conal McGinley, Fiachra McGinley (0-1); Mark Ward (0-3), Danny McDyre (0-1), Shane Coneely (1-0); Cathal Lowther, Stephen Griffin (0-7, 3f), Barry Griffin. Substitutes used: Eddie Gallagher for Mark Ward: Half time; Pauric Coyle for Danny McDyre: 54 minutes; Jamie White for Cathal Lowther: 58 minutes; Liam McGourty for Shane Coneely: 58 minutes; Conor McGowan for Barry Griffin: 58 minutes. Yellow Cards: Stephen Griffin: 38 minutes; Stuart Johnson: 43 minutes. Peter Boyle; Johnny Gallagher, Darren Drummond, Ciron Whoriskey; Kieran Keown, PJ McGee, Philip O'Reilly; Conor Gurn, James O'Donnell; Anthony Boyle, Brian Roper (0-1), Kerry Ryan, David Dolan, Michael 'Sticky' Ward (0-2f), Conor Patton. Yellow Cards: Shane McShea: 30 minutes; Kerry Ryan: 38 minutes; Darren Drummond: 46 minutes; Michael 'Sticky' Ward: 54 minutes.